Anne Meis Is Officially An AG-ceptional Farmer! Nebraskans are known for their honesty, friendliness and hard work ethic. The more rural the community, the more those traits are evident and you can’t get much more rural than Elgin. It is only fitting that one of our own was honored last week. 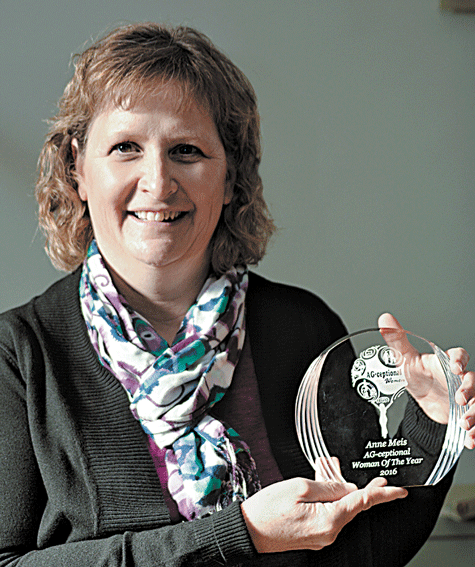 On Friday, Elgin’s Anne Meis was awarded the AG-ceptional Woman of the Year award at the 8th Annual AG-ceptional Women’s Conference held in Norfolk on Friday, November 18. Meis was notified of the her award at an August Elgin FFA meeting where she was the guest speaker. She was handed a note by her daughter Marie at the end of a trade mission presentation she gave on a trip she attended as a member of the Nebraska Soybean Board and she was asked to “keep it a secret”. In past years, AG-ceptional Woman honorees did not learn they were selected for the recognition until the video was played during the conference’s opening session. Since Meis’ has been involved in the conference each year (attending it for the last 6 years), organizers had to find another way to surprise her. The announcement was made public when a video tribute was played during the opening session of the conference Friday. The video was sponsored by Farm Credit Services of America and was produced by the Northeast Agriculture Department and Media Production Group. “I was completely shocked,” she said of her reaction that evening. “It took me a while to process it. It really caught me off guard”. True to her nature, she said “I thought someone else deserved it more than me”. Since she has had several months to reflect upon the award leading up to the announcement, she has been able to ponder what it means to her, her family and women involved in agriculture. Meis was nominated by Elgin FFA advisor and ag instructor Julia Schwartz. Mrs. Schwartz told the Elgin Review that, while she has not been able to attend the conference, when she heard of the award she immediately thought of Anne.